Google has accidentally made public a YouTube video that shows Android 3.0 in action. It's a completely new interface for tablets that borrows a lot of ideas from BumpTop, the 3D desktop software acquired by Google last year. Engadget says that the new interface "looks more or less nothing like Android". You might think it's a new operating system. The video mentions that this is "the next generation of Android" and that's built entirely for tablets. Google has focused on improving the user interface and Android 3.0 comes with fluid home screens, better app switching, browser tabs, video chat, dynamic app shortcuts and new versions of Google's Android applications that take advantage of the bigger screen. It seems that the Android tablets that will be launched in the coming months will have impressive hardware and an updated operating system that looks stunning, so they're poised for success. Update: Google confirms the release of Android Honeycomb. Anybody see Matias Duarte's name appear on one of the scenes? We gotta thank him for this UI! Does the assumption that the video release was a mistake stem from this quote, "Google has since made the video private (thus not allowing the general public to view it), but luckily, we managed to grab a backup of it before they did so," or something else I missed? Also, am I correct in thinking that this Android version is exclusively for tablets? Finally, Alex, would you agree with this ZDNet article that the success of non-Apple tablets depends almost entirely on Honeycomb? I can certainly appreciate the argument. Is this Android only for tablets ? So, which way is Google going. I thought Android was going to be their mobile OS and Chrome OS would be their laptop OS. What is the point of Chrome OS if Android will be on laptops soon? @Drudo. I'm confused. Who says "Android will be on laptops soon"? My understanding from what Eric Schmidt said at D3 (I believe it was D3) is that Android is for smartphones/tablets, while Chrome OS is for laptops. On the other hand, Android is already on some netbooks (such as the Acer Aspire One). If Google is developing Honeycomb exclusively for tablets, will mobile Android OS development branch off, and one will require different branding to emphasise the difference? @geeceeree, in his interview with Engadget, on this question Matias Duarte of Google user experience indicates no. He says at 11:20 "What you see in Honeycomb is absolutely the direction for Android. ... We have to serve all of Android's needs. ... Android shows up on a car, you're going to see the same the same kinds of improvements, the same design philosophy, the same usability improvements, the same new paradigms, new tools", and later confirms various features like the task switcher and application bar will scale to smaller devices. The details of how the new software shows up on other Android devices are vague, all we've seen are sneak peeks on tablets. Honeycomb shows off it's graphical power in it's launch. It's a new revolution in the 3D games and graphics. Game lovers, it's your era that's gonna come. can the china android pad support this honeycomb ? I just purchased an ASUS Transformer,which is a honeycomb tablet. I'm pretty impressed with it. A friend of mine has an iPad and has taken a look at my tablet and admitted it's more powerful. 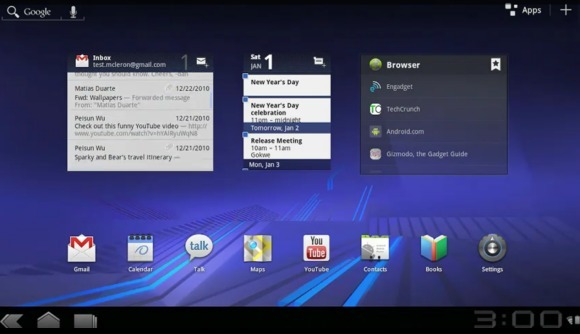 Where can I download the honeycomb for my android tablet? Can't find the specific download for the that can anyone give me the link please? Honeycomb? I had to check to make sure I wasn't reading a version of Betanews cached last year.